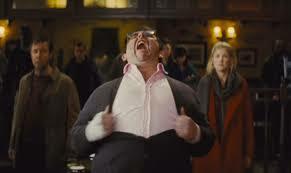 I adore the first two films in Edgar Wright’s “Cornetto trilogy”. Both Shaun of the Dead and Hot Fuzz had a masterful understanding of their respective genres and used them as starting points for exploring themes of arrested development and societal conformity, all with vivacious humor. Shaun of the Dead in particular knew how to transition between rollicking humor and devastating pathos with sprightly finesse. 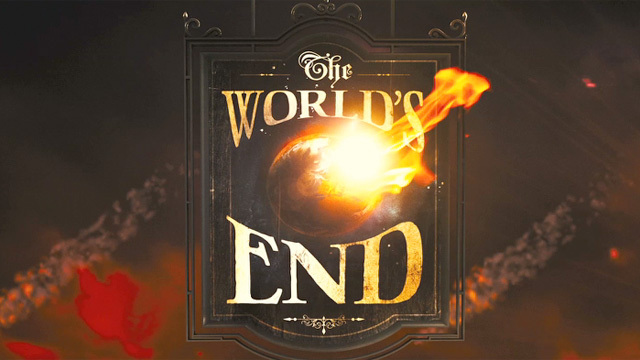 What makes The World’s End such an impressive, and also organic, step forward for Wright is that he folds even more poignant insights and dramatic character beats into the recipe and still never overwhelms the comedy. This may sound like an unwelcome compliment to all those who treasure Wright’s playfully anarchic sensibilities, but The World’s End is his most mature film. Fortunately, it is also every bit as much madcap fun as his other two comedic masterworks. Wright demonstrates that he not only understands both what is funny and what is moving, but that he knows how to play the two in beautiful harmony with one another. We first meet Gary King, our main character, at an alcoholics support group. In flashback, he recounts a story from his twenties. On one fateful night of heady youth, he and four mates set off to conquer the Golden Mile, a string of twelve pubs in the small, quintessentially British hamlet of Newton Haven. Despite their best efforts, inebriation and the dreaded cross-fade conspired to keep them short of their goal. Gary is now close to his forties, but the passage of time has not stopped him from reminiscing incessantly about that last big night, nor from fantasizing about a second attempt at his boozy Holy Grail. And so, decades later, he rouses those same four friends from their middle-aged slumber and coerces them to return to Newton Haven with him. All four are in varying states of adult malaise and each of them looks on Gary’s exuberant man-child with some mixture of bemusement, pity, and anger. The anger is primarily supplied by Peter (Nick Frost), who had a falling out with Gary many years ago when the two were involved in an alcohol-related accident. As the four distant friends set off down the path of their lost youth, only Gary seems enthusiastic about revisiting this juvenile past. In the early scenes, Wright’s immensely talented cast deftly conveys a shared history filled with fond anecdotes but also pock-marked with bitter feelings. Then, around the third pub, Gary goes into the toilets, gets into an altercation with a taciturn youth, and suddenly finds himself drenched in a blue goo that is now spurting from the place where the young man’s head used to be. From here, the film veers into science fiction, as Gary and company uncover a body-snatching plot hatched by an intergalactic collective that wishes to civilize the town’s residents and sand off the rough edges of their foibles, flaws, and addictions. The movie evolves from an intimate dramedy into a blockbuster science-fiction comedy without warning, and yet Wright manages to make it all feel seamless. Both before and after the big supernatural reveal, the film is an uproarious, literate, and moving tale about clinging to the past, reconciling with the people we have hurt, and improving ourselves without suffocating the feisty demon inside that makes us human. A big part of the credit belongs to Simon Pegg and Nick Frost, Wright’s constant collaborators, who both turn in the best performances of their careers. Pegg’s Gary King is the most fascinating blend of pathetic, infuriating and hilarious since Ricky Gervais gave the world David Brent. Pegg clearly relishes the chance to play such a richly diverse range of notes, often in the same scene, sometimes in the same sentence. He plays Gary as a man willfully ignorant to much of the damage his alcoholism has caused. A wiry, sophomoric Falstaff, Gary is too eager to bulldoze over unresolved emotional issues with boisterous humor, and yet Pegg manages to avoid the kind of one-note boorishness we might get from a comic like Danny McBride. There is a weary self-awareness behind Gary’s maniac grin that hints at raw desperation, regret and a perpetual fear of having to face the unknown future. Frost, who has played the gregarious, affably dense foil to Pegg in Wright’s other films, is now called on to play an intelligent straight man and the most estranged of Gary’s friends. He knocks the role out of the park with a coiled intensity I never knew he had in him. The numerous dramatic scenes work exquisitely well within the overall comedic tone of the film because the actors commit fully to these characters as flesh-and-blood human beings. 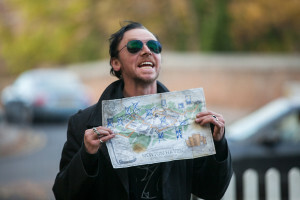 Frost is asked to convey a lot of genuine hurt and frustration and he, like Pegg, seems positively electrified by the new acting challenge Wright has placed in front of him. Backed up by a script that crackles with energy and wit, he uses his gifts as a humorist to make Peter’s anger both bitingly funny and startlingly real. Paddy Considine, Eddie Marsan, and Martin Freeman also work mightily to give us a film that functions honestly as comedy, as intimate drama, and as whiz-bang science fiction. 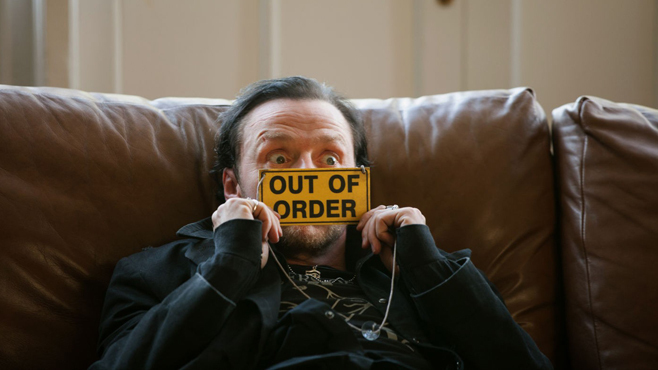 The World’s End may be a science fiction spoof, but it is also quite simply a great piece of science fiction. It represents what the genre, at its very best, is capable of. Like so many great science fiction artists before him, Wright seizes upon the freedom of a supernatural story and uses it to ask basic questions about how our fallibility makes us more complex. At one point, Gary’s friends ask him to verify that he has not been taken over by a bodysnatcher (referred to in the film as “blanks”), so he bashes his head against a pillar. Gary argues that this proves he is human. One friend counters that it simply proves he is stupid, but the film sees the two as one and the same. Like a cheekier, infinitely less sinister version of Kubrick’s A Clockwork Orange, this is a film that looks at a phenomenally unhealthy character and then defends his right to be unhealthy, at least when the alternative is conformity and sterile perfection. Gary comes to see that he must change, but that change needs to happen organically and internally. In this regard, Wright has not only created a meaningful work about myopic nostalgia and regression, but also about addiction and healing. Once again, I am floored by how much heart, soul, and intelligence is on display in such a tremendously energetic blockbuster film. And, of course, all of that has been lovingly packaged inside the year’s funniest comedy. It’s not that I didn’t already know that Edgar Wright could make a brilliant genre comedy. I just didn’t know that he could speak so honestly and so resonantly, while continuing to keep his tongue firmly in cheek.